Notice: Please test the functionality of this item before installation. 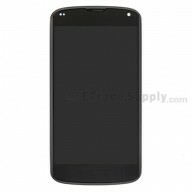 This item includes the LCD screen, digitizer touch screen already attached. This item is 100% OEM manufactured and assembled. The flex cable is very sensitive and is easily damaged. Handle carefully. These parts are hermetically attached, special tooling is required for assembly or disassembly. The installation of any new part should be done by a qualified person. ETS is not responsible for any damage caused during installation. It's the second bought. Perfect color. Touch very sensitive. Great!